Welcome to Prana Yoga Center located in Genesee County in beautiful Grand Blanc, Michigan! We offer yoga classes for all levels including Prana Vinyasa, Lunar Vinyasa, Ashtanga (short form and Primary Series), Slow Flow, Hatha Basics and Yin Yoga. Please come join us! 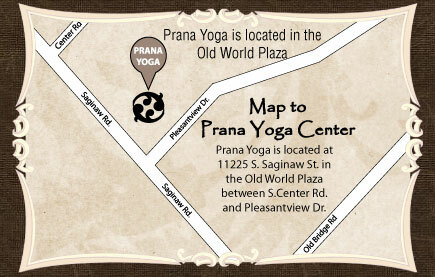 DIRECTIONS: Prana yoga studio is located at 11225 S. Saginaw St. in Grand Blanc, MI in the Old World Plaza between S. Center Rd. and Pleasantview Dr.